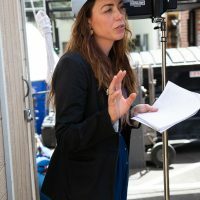 Maya Albanese is a Writer/Director known for social impact and underdog empowerment storytelling, which has a magical, ethereal, surreal, and/or bittersweet tone to it. Maya was awarded the inaugural Commercial Directors Diversity Program fellowship that supports women directors in the commercial industry by the Directors Guild of America (DGA) and the Association of Independent Commercial Producers (AICP). She has directed and shot documentaries and commercials on five continents, in Spanish, French, and English, for IBM Women, Nike Women, Kids Foot Locker, Manchester United, John Frieda, Chevrolet, Ketel One, Capital One, JCPenney, Chevrolet, Capital Group, etc. Her documentaries have premiered at festivals worldwide including DOCNYC and her multimedia has been published across NBC News, The Today Show, Food Network, The Washington Post, The Huffington Post, The Miami Herald, VOX, Racked, EATER, Popsugar, Narrative.ly, and many more. She has a Masters degree in Documentary Filmmaking from Columbia University in New York.